Date: 20 May 2014. Boat Bums. Life on the water is wonderful and it can be inexpensive, but all too often a bum will buy a boat. Buying a boat doesn't make you a boater any more than sleeping in a garage makes you a car. Anyway, the bum will buy a boat and then take her to a port, anchor unsafely, then abandon the boat when life gets a bit tough. Wimps -- and bums -- ought not to be out here. Photo taken 11 March 2014. Fathoms Bar is directly astern the boat. At first I admired the couple. I suppose when someone makes the same choices as I do, I'm inclined to think well of them. They had a small tender (like me) with a trolling motor (like me) and were living on a small power boat (like me) so... well, I was prepared to like them. Until I watched the circus for a day or two. It became apparent that they didn't know how to properly anchor the boat. I ended up nicknaming the boat Drags-A-Lot as it moved with every tide change. Why you may ask. The anchor rode (a line) is going almost straight down from the bow. There isn't enough scope out, and the boat is regularly moving about the anchorage. What finally sealed my opinion happened while I was watching the boat drag around the anchorage. About dusk the couple boarded their tender and went to the docks at Fathoms -- a local watering hole. Frankly, if your boat is dragging, stay on the doggone thing and do not leave her. Period. No exceptions. Another week passed and indeed she was still dragging. She managed to go over one of the oyster beds without snagging, crossed the channel and ended up on a dock between two shrimp boats. There she remained for another couple or three weeks. Finally she was re-anchored and I no longer saw anyone aboard. Fast forward to 30 April when I looked up and noticed that the boat was listing dangerously and appeared almost ready to sink. 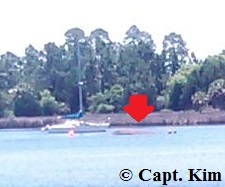 This was at 1800 (6 p.m.) and it looked like her aft quarter was only about 6" or so above the water. Indeed, within a half hour she'd overturned and sunk. And, now the owners are missing. Not drowned -- no, just gone. They've left the boat in the middle of the harbor, upside down and awash. And nearly invisible. It's a mess. 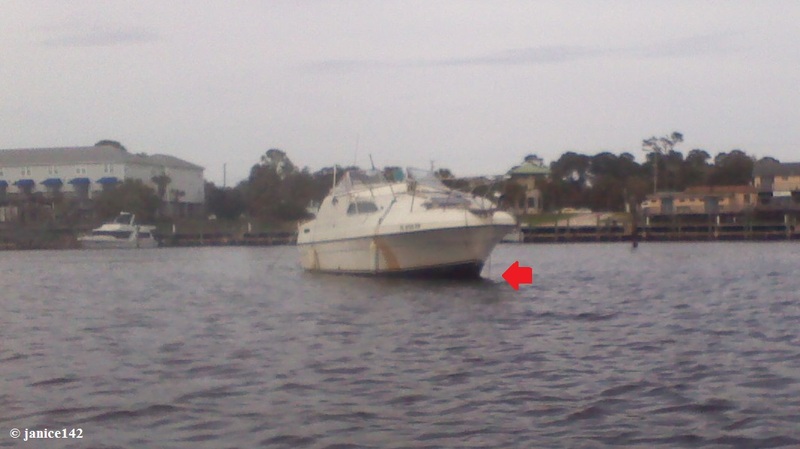 A few days after the boat sank a local fellow named Nelson went out and added a couple of round red Taylor fenders so the hazard shows up (black bottom paint made her difficult to see) but still, it's a mess -- and giving good boaters everywhere a black mark. Bums are bums, be they dirt dwellers or not. And boat bums irritate all true boaters. Fortunately these two might be easier to track down as local scuttlebutt says the authorities have a lead on ownership. And the owners will be forced to get rid of the problem. Thank goodness. 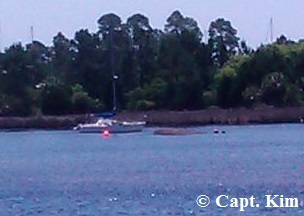 In the meantime, it's a hazard and warrants a careful look-see when you come into the Carrabelle River (south branch) to anchor. Addendum: 24 May 2014. Honestly, I debated publishing this piece. I feel strongly that there are plenty enough laws regarding boats and boaters. What we lack is enforcement of those rules and regulations. So, before you get up in arms saying "we need more laws to prevent boat bums" try asking for the enforcement of what's already on the books. Law Enforcement Officers can do a lot more than Homeland Security and drug interdiction. They used to. I remember when if you got in trouble on the waters, a call to the Coast Guard brought rescue. The Coasties delivered fuel, pulled you off groundings, pumped your boat, etc. They were the Good Guys. The men and women LEO's still are good folks and they don't take the job unless they have an abiding desire to help. Maybe some input from those on the waterfront that enforce the rules is a step in the right direction. Enforce the rules that exist. Period. Nothing more, nor anything less. What do you do when a boat bum appears? And, have you ever had to deal with an abandoned boat? *Newspaper article by Lois Swoboda published 28 May 2014 in The Times. A favorite aphorism: He had delusions of adequacy. Walter Kerr.